The seventh episode, “Aeolus,” is where the fun really begins. Up until now we’ve had a fairly naturalistic novel, experimental in narrative technique but hewing close to a few modes: exposition, internal monologue, etc. When episode seven opens, we right away know something’s up: what are these headings doing here? This is the chapter where the true star of the book emerges, what David Hayman dubbed “the Arranger”: a narrative persona beyond simple first or third person, a kind of Artist-God behind the book, playing games with the reader. We’ll see a lot more of him in the second half. –He spoke on the law of evidence, J.J. O’Molloy said, of Roman justice as contrasted with the earlier Mosaic code, the lex talionis. And he cited the Moses of Michelangelo in the vatican. –A few wellchosen words, Lenehan prefaced. Silence! Pause. J.J. O’Molloy took out his cigarettecase. What is happening in that last line? Who is speaking? Who are the two who “both” are having the course of their lives determined? For that matter, who is “Messenger”? It seems reasonable to say that it is either J.J. O’Molloy or Lenehan, the two who are speaking here, but why do we suddenly have this drastic change of tone? I’m sure many critics have puzzled over it: I rather thought it might be an example of a rhetorical device, but neither Gifford nor Gilbert seems to mention it. Thoughts? And while I’m putting questions out there: what do people think of Stephen’s Parable of the Plums? That’s something the critics almost always address, usually chalking it up to political allegory (see, for example, Richard Ellmann’s guide Ulysses on the Liffey, which I don’t think I’ve mentioned yet). But every time I read it I’m still puzzled by it. What do you guys make of it? In my last post I pointed out that one way of reading Ulysses is as a ghost story: and probably no chapter is more haunted than “Hades” (well, maybe: feel free to disagree with me about that in four weeks or so). There are several qualities of spectre populating this chapter, and I’d like to make a brief attempt to catalog them. First, there are the obvious ghosts of the characters’ lost loved ones: Daryl’s already written on Bloom’s beautiful elegiac thoughts of Rudy, which weave into his memories of his father’s suicide; we can place these alongside Simon Dedalus’s self-pitying but still moving grief for Stephen’s mother. And of course there’s “poor Paddy Dignam,” our Elpenor. The Odyssey parallels seem particularly thick in this chapter, as are the Hamlet allusions, offering a second class of spectrality: the episode, like the book, is haunted by the Ghost(s) of Literature Past. More importantly, the chapter is populated by the shades of Joyce’s previous fiction: we open on a carriage filled with Bloom and three familiar faces. Martin Cunningham and Mr. Power both appeared in one of the most significant stories in Dubliners, “Grace”; Simon Dedalus, of course, looms large throughout Portrait (and there’s also a mention of “old Mrs Riordan” (6.378) from the famous Christmas dinner scene). Many more names from Dubliners appear in their conversation, or on the street as they drive by: Ignatius Gallaher (“A Little Cloud”), Paddy Leonard and Peake (“Counterparts”), Crofton (“Ivy Day in the Committee Room”) and others. The one story that you would most expect to see a connection to, “The Dead,” doesn’t seem to be mentioned, but it looms there in the background. (Gretta Conroy came up in episode 4; Gabriel will be mentioned in 7). Speaking of Mrs Riordan and “Ivy Day,” perhaps the biggest ghost in the chapter, and the one that eludes many contemporary readers, is the ghost of Parnell, who along with other shades of Irish history and politics haunts the city of Dublin and the conversations of its citizens. That’s far from my area of expertise, however, so I won’t linger over it. 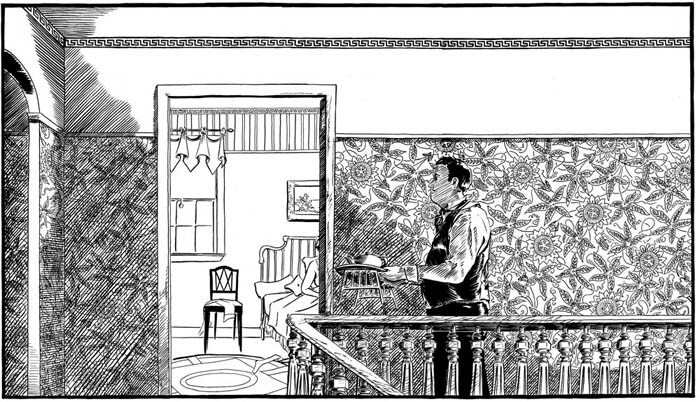 Finally, the ghosts that I find most affecting in this chapter are two still-living characters who flit through it. Stephen is spotted by Bloom, but isn’t recognized by his own father, to whom he is as good as a ghost at this moment. And Molly haunts Bloom’s thoughts throughout the book, causing some quite painful moments in the carriage when she and Boylan come up in conversation, leaving Bloom to “review the nails of his left hand, then those of his right hand” (6.200). So subtle! Anyway, that’s just a brief comment on one of my favorite chapters. I hope to have more on another of my favorites, “Lestrygonians,” later in the week. The allusion to Blake in the first sentence (which, for once, Stephen is kind enough to tell us from whom he’s quoting) sets up an interesting dualism by which to consider Joyce’s craft: Fable vs. Memory. Ulysses is fiction (fable), but it was born from memory, as the Muses were born of Zeus and Mnemosyne. And yet, it is not memory: it is “in some way… not as memory fabled it.” What is the relationship of the memory to the fiction? For that matter, what is the relationship of memory to history (which is really just another form of fiction, as historiographers such as Hayden White [certainly not the first to say so] like to tell us)? “History [is] a tale like any other too often heard” (2.46-7). Memory is fallible, as the first page of this episode goes to great lengths to establish: the students “forget the place,” which Stephen is only able to remind them of by glancing at his “gorescarred book”: writing, of course, is just a form of “mnemotechnic” (a favorite word of Bloom’s), and evolutionary psychologists point out with the rise of writing a concomitant decline of memory: see the difference between oral and written cultures (a difference especially pertinent in this book of all books, where a great oral epic provides the “basis” for a very written epic). And why is the book “gorescarred”? This word cuts several ways. We can consider the abuse a school textbook is likely to suffer leaving it stained and marked; but perhaps the “gore” is the gore of the battles being described on the page. Consider, also, the circumstances under which the book we are reading was written. Ulysses (whenever Joyce mentions a book, one can assume, narcissist that he is, he is talking about his own), written in a Europe in the grip of the First World War: the compositional circumstances of this book leave it more than a little “gorescarred” itself. Granted, the scene is set before the war, but Joyce licenses a collapse of time, of writing and memory, in the above-quoted paragraph: “I hear the ruin of all space, shattered glass and toppling masonry, and time one livid final flame.” Note the subtle sliding of tenses, “shattered glass” (past) and “toppling masonry” (present), calling to mind images not of the ancient battle of Tarentum, but the more contemporary vision of Europe in flames. (I owe this observation to a lecture of Eddie Epstein’s). Joyce possibly gives us a clue to his use of history in the address of one of Stephen’s students: “Vico Road, Dalkey” (2.25). While certainly a reference to a rather prosperous suburb of Dublin, the name Vico evokes for any fan of Finnegans Wake the Italian philosopher Giambattista Vico, whose circular theory of history dominates Joyce’s final work. History, like memory, is a repetition: we don’t “member” something, we “REmember” something. Memory is always a coming-again. The argument of this passage seems to be that history is, as well. 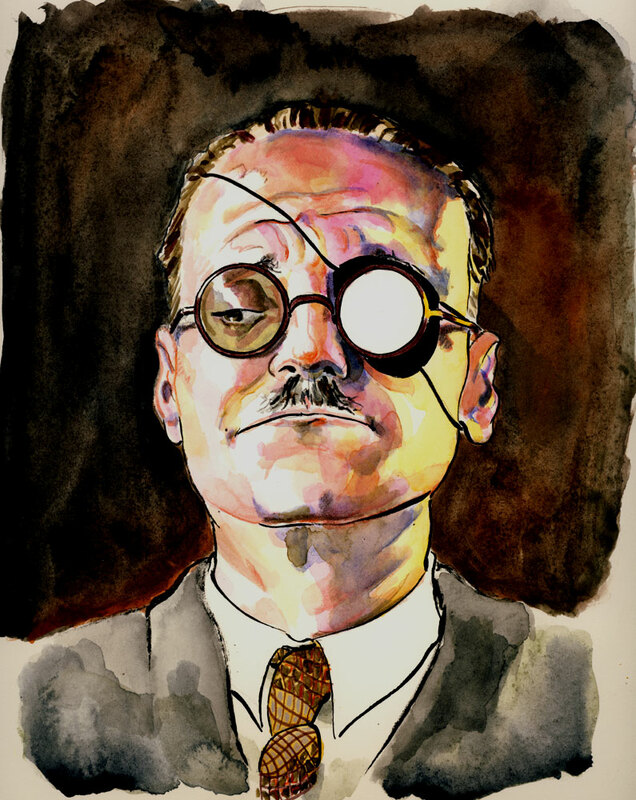 (For an interesting reading of Joyce’s sense of history in this episode, see this brief post by my fellow Wakean, David Auerbach). The sense of repetition is crucial here: the students ask Stephen to tell them a ghoststory, a tale of the dead coming back again. And Ulysses is certainly haunted: we have already seen how Stephen is pursued by the wraith of his mother, and he’s not the only one dealing with ghosts in this book. Instead of the requested story, Stephen has them turn to “Lycidas,” a memorial elegy to Milton’s late friend: so, perhaps a sort of ghoststory after all. But the student reading aloud doesn’t turn the page, instead repeating the lines he just read. These kinds of repetitions riddle the chapter: another student is instructed to copy problems from the board, but is unable to do them for himself. Later he dries his page with blotting paper, creating another copy-trace. (I’m tempted to go all poststructuralist here, with “traces” and “iterability” and all that floating around, but I will restrain myself [for the time being]). “Futility,” thinks Stephen, in the face of these repetitions. All these reflections on the endless repetitions of history lead Stephen to utter his famous remark, “History is a nightmare from which I am trying to awake” (2.377). I can’t help but think of Freud, whose Beyond the Pleasure Principle was published a mere two years before Ulysses, so it is unlikely that Joyce would have read it. But in this episode he provides us with his own, fully realized vision of the repetition compulsion made famous in Freud’s essay. I’d like to start out small here, looking at two words from the first chapter: the first word of the novel, “Stately,” and the first-personal pronoun, “I” (as well as its objective-case, “me”). Obviously, this isn’t a lot, but for me the richness of Joyce has always been how much you can do with a little of what he gives you. All this playing with letters as codes is well and good, but what about the word? Why “stately”? I like the way its grammatical sense is ambiguous: is it an adjective or an adverb? Initially I read it as the former: Buck Mulligan is both stately and plump. This is the way it is generally taken, I think. But what if you read it as an adverb, describing the manner in which Buck “came from the stairhead”? Does that make any less sense? On a certain level it actually adds something: the earliest definition in the OED of “stately” as an adverb reads “With splendid ceremonial or surroundings; in state.” Given that the first thing we see Buck do is intone the opening of a Mass, “splendid ceremonial” doesn’t seem too far off. Also, the use of adverbs is part of the narratorial style of this chapter, as one of our commentors noted, which Bernard Benstock attributes to the focalization of the narrative through Buck Mulligan’s point-of-view (in Hart and Hayman, James Joyce’s Ulysses: Critical Essays [U of California P, 1974]). Does it make a big difference which way you read it? No, I suppose not. But I like that Joyce gives us a little taste of verbal ambiguity right out of the gate. There’s more where that came from. (As an aside, here are the opening words of an early French translation [Auguste Morel with Stuart Gilbert and Valerie Larbaud, assisted by Joyce]: “Majestueux et dodu…” Nice, right? Though [and I know too little French to be sure of this] I think it loses the adverbial possibility. And in German [Georg Goyert, again with the author’s assistance]: “Gravitätisch kam de dicke…” Which sounds like just the kind of polyglottal pun that Joyce would have relished [another opening-line word to watch out for, “relish”]). We aren’t yet in true internal monologue: the pronouns are all still “he,” not “I.” We’re sort of toeing the line between focalized narration and free indirect discourse. It makes sense: Joyce starts us out slow. 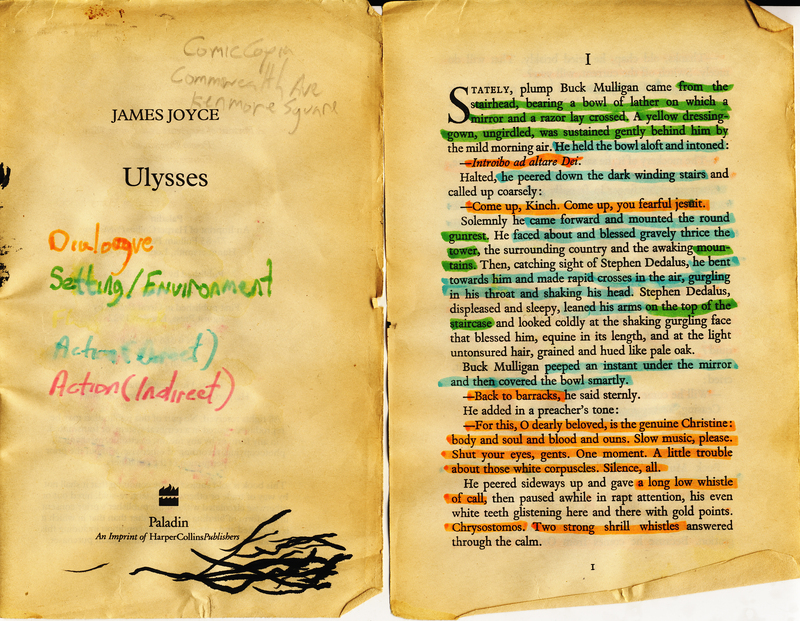 We have to learn how to read Ulysses, and while he won’t necessarily make it easy, he is here to teach us. However we label it, this paragraph jumps out of the page: clearly we are in a different mode. And we learn right away to associate this mode with memory (not a very pleasant one, in this case). So, crucially, even Stephen’s first bit of internal monologue, a reflection on identity, is relying on the words of others. We will see this throughout: Stephen’s thoughts, however self-absorbed, are presented through allusion and academic philosophical argument, rather than anything direct and, well, human (as opposed to the very human thoughts of Bloom). The choice of a poem about a louse is fitting, of course, as Stephen hasn’t washed his “dogsbody” in some time. But what about “It asks me too”? What asks him? Asks him what? Fergus’ song: I sang it alone in the house, holding down the long dark chords. Her door was open: she wanted to hear my music. Silent with awe and pity I went to her bedside. She was crying in her wretched bed. For those words, Stephen: love’s bitter mystery. (1.249-253). This is our first encounter with “I”: but Joyce wants the word to trouble us, as it troubles Stephen. In his next reverie he thinks of his school days: “So I carried the bowl of incense at Clongowes. I am another now and yet the same.”(1.310-12). Throughout the book we will be asked to wonder, with Stephen and Bloom: was “I” then the same as “me now”? He walked on, waiting to be spoken to, trailing his ashplant by his side. Its ferrule followed lightly on the path, squealing at his heels. My familiar, after me, calling, Steeeeeeeeeeeephen! A wavering line along the path. They will walk it tonight, coming here in the dark. He wants that key. It is mine. I paid the rent. Now I eat his salt bread. Give him the key too. All. He will ask for it. That was in his eyes. (1.627-32). Here we are in Stephen’s mind: so who paid the rent? Stephen, right? Well, maybe. Historically we know that it was in fact Oliver Gogarty, the basis for Buck Mulligan, who paid the rent. But that’s not conclusive: obviously this is a work of fiction, and Joyce is free to change whatever details he wants (especially if it serves to make him [as Stephen] appear more persecuted). But what about “Now I eat his salt bread”? Gifford tells us this is an allusion to Dante, in Paradiso, where his great-great-grandfather predicts Dante’s future exile: “Thou shalt make trial of how salt doth taste another’s bread,” e.g. you will see how hard it is to live in a home that is not your own. This allusion seems to indicate that Stephen is already an exile. So who pays the rent? One way to read it is that within Stephen’s interior monologue, he is imagining the direct discourse of Buck: “He wants that key. ‘It is mine,’ [he will say]. ‘I paid the rent.’ Now I eat his salt bread.” But there’s really no way to know for sure. Complicated? Yes. Beyond what Joyce expects of his readers? By no means.